“If RSS-controlled BJP returns to power, these constitutional pillars will be destroyed and India will be turned into a Hindu country. So, our only job is to dislodge the Modi government from power,” Bijan Dhar said. Accusing the BJP and RSS of attacking constitutional institutions, Tripura Left Front convener Bijan Dhar Sunday said if the saffron party was voted back to power, it would destroy all constitutional safeguards and turn India into a Hindu state. 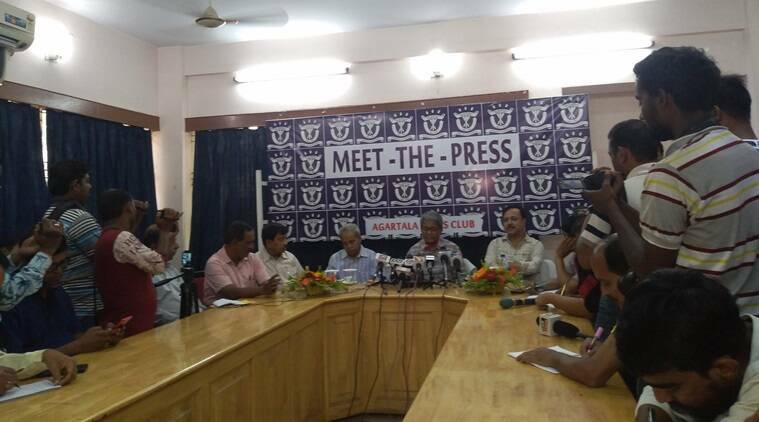 Addressing a ‘Meet the Press’ at Agartala Press Club, Dhar said the four pillars of the Constitution – secularism democracy, social justice and federalism were at risk under the BJP rule. “If RSS-controlled BJP returns to power, these constitutional pillars will be destroyed and India will be turned into a Hindu country. So, our only job is to dislodge the Modi government from power,” Bijan Dhar told reporters. He appealed to supporters of Congress, Indigenous Nationalist Party of Twipra (INPT), Indigenous Peoples Front of Tripura (IPFT) and other regional political parties of Tripura to vote for CPI(M) in the Lok Sabha polls. Replying to questions about poll preparations in the changed political scenario, where BJP is in power at the Centre and state, Dhar said he was confident of victory in the two Lok Sabha seats of Tripura if peaceful, free and fair elections were held. “Both Lok Sabha seats of Tripura were won by communists since 1950s except a few elections in between. If the polls are held peacefully and in a free and fair manner, we are confident of victory in both seats”, he said. The senior communist leader ruled out the possibility of an alliance with Congress or other regional political parties in Tripura, saying the Grand Old Party and BJP have worked at the behest of capitalist forces. However, he said his party would maintain “less distance” with Congress compared to BJP. Dhar said the BJP-led Central and state governments had cheated with the people of the country. He said BJP made lofty promises and came to power but didn’t fulfil any of them during their rule. “These promises are impossible to fulfil. So, people are frustrated and are opposing them,” Dhar claimed. Opposition leader and former CM Manik Sarkar will lead campaigns in some places of Tripura, Dhar said, adding that central leaders were also expected to visit the state ahead of the elections. Tripura has two Lok Sabha seats. West Tripura constituency is scheduled to go to polls on April 11 and East Tripura seat is scheduled for April 18. About 25,98,290 voters are scheduled to exercise their franchise in two phases of Lok Sabha polls in the state this year.